I'm not exactly sure what the connection is between Jesus being the answer and RV sales. Does Jesus drive one of these things? If so, how does he make sense of his philosophy and the gas-guzzling nature of this recreation, which could be interpreted as immoral? 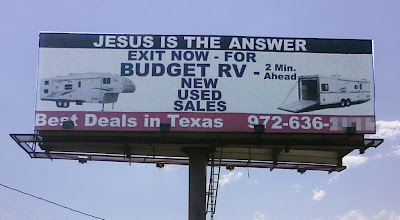 Is Jesus the best deal in Texas, or is it the RV? Or is Jesus actually an RV, sent here to save us from high-priced camping? If so, why do we need to make a decision between the new and used version? And just what is a used Jesus? Questions to ponder, indeed.